La Paz, 5 ago (PL) Bolivian President Evo Morales announced that he would ask the Union of South American Nations (UNASUR) to reject the installation of foreign military bases in Latin America, following a meeting with his Colombian counterpart, Alvaro Uribe. “We will take a proposed resolution to the UNASUR meeting rejecting the presence of any foreign armed military in the region,” said the head of state at the end of a brief conversation with Uribe in the Palacio Quemado. According to Morales, quoted in the newspaper Cambio, the Bolivian proposal will be presented by the delegation to the summit of the political and economic bloc, which will be held on August 10 in Quito, Ecuador. Uribe left the presidential palace in La Paz the same way he entered: with a meager greeting to the people and without emitting a single comment to the press that was present regarding the issues discussed with Morales. Colombia hopes to sign this month an extension of its military agreement with the US that would include the use of 7 military bases in this South American country by US soldiers. 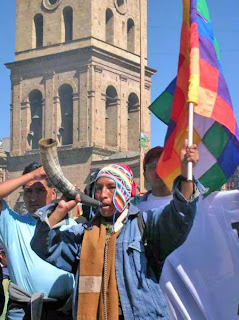 The head of state of Aymara origin, recalled that in Bolivia, armed foreigners persecuted the peasant movement and that he was victim of their abuse, which is why he considers the move as an act of aggression. “We reject the presence of US soldiers in the region because the empire always has its objectives; to allow the presence of military bases is an attack on democracy,” he indicated. Morales also expressed his preoccupation to Uribe regarding the situation in Latin America, given that he felt that accusation were being made from Colombia against the president of Venezuela, Hugo Chavez, and of Ecuador, Rafael Correa, just as the US use to do against the leader of the Cuban revolution, Fidel Castro. Furthermore, he stated that at the Quito meeting, the Bolivian government would request the creation of a Defense School and propose the regionalisation of the struggle against narcotrafficking. Moreover, the Bolivian head of state explained that the meeting with President Uribe was also held so that the Colombian could express his preoccupation over the differences that his government has with Venezuela and Ecuador. Not only a defense school would be in the defense interests of central America, but also military cooperation and intelligence between United Central Americans for counter defense and sharing of information on mutual cooperation for a better future of Indigenous people of UNASUR.